Galvanic treatments employ this low-level, medium amperage direct current to achieve a multiple skin benefits like stimulating cells, moving tissue fluid, softening up blackheads and driving ingredients deep into the epidermis. What exactly occurs? Depending upon the polarity used (either negative or positive, through a switch on the machine), a water-soluble, ionized and either positively (acid pH) or negatively (alkaline pH) charged solution is pulled or repelled into the skin. This is achieved by creating a circuit through a metal “active” electrode being placed on the skin that’s connected by a wire to the galvanic machine. This working electrode may be a roller, a ball, prong or tweezer and, in some cases, an ionto-masque. An “inactive” electrode is then placed under the shoulder, held in the hand or clipped to the wrist or arm. This electrode is normally covered by a damp sponge or gauze to increase conductivity and ensure client comfort. This scenario creates a low-voltage (“voltage” being named for Galvani’s contemporary, fellow scientist Dottore Volta!) circuit or loop, so the current runs through the body, flowing in one direction from positive (+) to negative (-) or vice versa depending on the machine setting or technique employed. Therefore, any substances applied are PULLED, not PUSHED, into the skin and penetration occurs as a result of that attraction. Using galvanic current on the positive polarity is referred to as iontophoresis. During an iontophoresis treatment, a positively-charged (acid pH) serum, gel or complex is first applied to the skin. The skin therapist then places the passive or inactive (negative) electrode under the client’s shoulder or into their hand. The positively-charged current is then delivered via the active ingredients deep into the skin via positively-charged ions or molecules. This simple electrorepulsion is ideal for treating aging skin and hyperpigmentation, as it carries active age-fighting and pigment-controlling ingredients deep into the stratum germinativum where they can impact cells. Galvanic on the positive polarity also has a calming and vasoconstrictive effect on the skin, helping to reduce sensitivity and redness, so don’t deny your Rosacea and sensitive-skin clients the benefits of this valuable technology. What Types of Products Can You Use? A multitude of products from serums to masques and even moisturizers can be used with iontophoresis if they have an acid pH and are water-soluble. Novel treatment protocols even feature iontophoresis with hydroxy acid-based liquid exfoliants for more intense exfoliation results on photo-damaged and highly-pigmented skins. How and When Do You Add Iontophoresis into Your Treatments? Iontophoresis can be implemented at various stages within a skin treatment; it is generally not offered as a standalone treatment. Typically performed for 4-7 minutes, the key element to remember is that galvanic iontophoresis assists in the penetration of any water-based products into the skin for any skin issue, even overly sun-exposed skin. It can be performed immediately after and extractions to provide extra purification and to constrict follicles. You may choose to use it on a specific area, like just the eye area, to introduce a collagen-boosting peptide or on an area of hyperpigmentation to control overactive melanin. Visible results are long-lasting for your clients, so try to incorporate it for a few minutes in all of your skin treatments and build it into the time and cost. 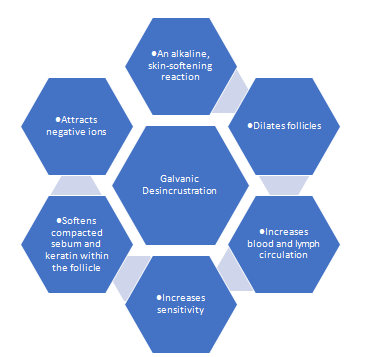 Galvanic desincrustation is a process that softens and emulsifies sebum and keratin in the follicle. It is by far one the greatest tools in the skin pro’s toolbox and can be integrated while also using warm steam on the client. Performed prior to manual extractions, desincrustation prepares the skin for safe, painless and successful removal of comedones and micro-comedones. It is the deepest way to clean the skin and remove congestion. Desincrustation solutions have an alkaline pH and are negatively charged, so they require the direct current to hold a negative charge. The client holds the positive (inactive) electrode and the negative electrode (active) operates as the working electrode. A desincrustation solution is applied to both the skin and the gauze or cotton covering the active electrode, which traditionally is a prong or tweezer, this is then moved over the affected area. The alkaline solution is drawn to the positive electrode in the client’s hand or under the shoulder and the negative ions in the solution are repelled by the negative electrode, causing an alkaline reaction in the skin. This works on the theory that like poles repel and opposite poles attract. 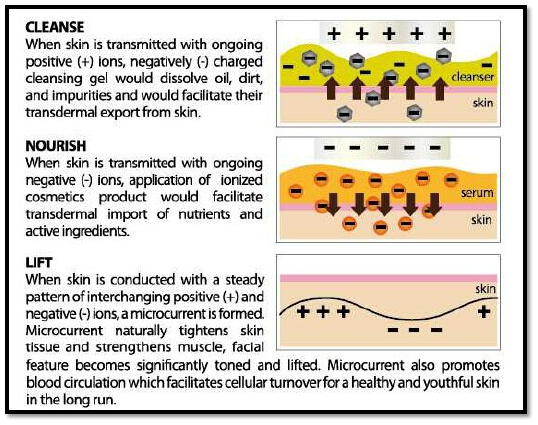 The desincrustation solution, combined with the action of the active negative electrode, results in the “saponification” of sebum. This alkali and sebum reaction forms sodium hydroxide (lye) due to the fatty stearic acids in sebum, reacting with the alkali to form soap. In the skin, the reaction softens and liquefies sebum, and this facilitates the easier (and highly-satisfying) release of even the most resistant blackhead, especially in hard-to-extract, “tight,” finely textured, sometimes dehydrated skin. Following manual extractions, apply a purifying, calming serum and switch the polarity back to positive to adjust skin to an acid pH to close follicles, calm and soothe. Desincrustation solutions usually contain various forms and concentrations of sodium (salt) like sodium chloride, sodium bicarbonate and sodium carbonate. Alkaline pH products soften skin while breaking down sebaceous debris, but this compromises skin health when the skin is left in this pH state, so removal of solutions and correcting back to acidic pH is critical. Think of your bar-soap-using clients and the drying impact this had on their skin. Look for professional products that deliver a salt solution infused with calming and purifying botanical extracts like Quillaja Saponaria, Burdock Root, Ivy and Watercress to reduce inflammation. Risks and Precautions: Is Galvanic Ever Dangerous? Clients with metal implants – including body-piercings with metal rings, etc. Discern these contraindication in the consultation, ensure you gain the client’s signature to prevent any legal action, this should be standard procedure for every treatment including galvanic. Galvanic treatments truly empower you as a professional skin therapist to make positive, lasting results on the skin of your client. Think back to the beginning of your career in our profession. It’s easy to get caught up in ingredient trends and techniques, but more than likely what first compelled you to pursue this career is the desire to help others. Integrating galvanic technology makes this goal a reality – and greater results mean greater respect for our skills, and even greater loyalty from our clients.